ŠKODA is making the mobility of the future a permanent feature of its everyday life. E vehicles play a crucial role in the company’s global growth strategy. In addition to plug-in hybrid vehicles, ŠKODA will also have five fully electrically powered cars in its range by 2025. From that point onwards, one in every four cars sold by the brand worldwide should be a plug-in hybrid or have a purely electric drive system. All of the ŠKODA models, which will also be zero-emission in the future, will impress with the typical qualities of the brand: with a long range, easy­to­use charging technology and outstanding economic efficiency. ŠKODA makes electromobility ‘Simply Clever’. “One of the four pillars of our 2025 Strategy is the electrification of our fleet. The ŠKODA SUPERB with plug-in hybrid drive will be launched as early as 2019. 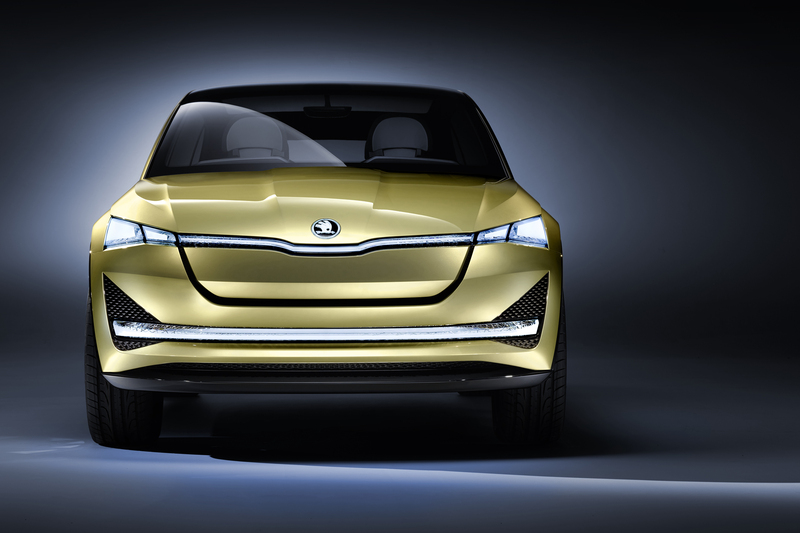 Then in 2020 this will be followed by our first purely electric model, into which we are offering a very concrete insight in Frankfurt with the ŠKODA VISION E,” said ŠKODA CEO Bernhard Maier. In parallel, ŠKODA is developing its own vehicle concepts for entirely electric mobility based on the modular electric car platform. This development is running in parallel to the implementation of additional levels of automated driving in production. In the future, the drivers will be able to transfer an ever-increasing number of driving responsibilities to their vehicle. The electric vehicles developed by ŠKODA will have the basic architecture required to integrate these functions, which will be usable in the medium and long term, into their in-car electronics. The automotive industry finds itself in the middle of a major process of change. New business segments are opening up for which ŠKODA has products and solutions ready, is developing them further or producing fresh designs. One field of activity is mobility services. The business areas which will benefit from this development include car sharing, the provision of on-demand mobility and numerous services directly linked to individual mobility requirements. In these areas too, ŠKODA has the potential to precisely identify customer requirements and fulfil them with clear, well-conceived and reliable solutions. At the IAA, ŠKODA is presenting its first purely electric concept car. The ŠKODA VISION E can drive autonomously at level 3. The design of the concept car ŠKODA VISION E exhibits distinctive features of ŠKODA’s new design language for electric vehicles. The opposed-opening doors and four rotating individual seats are an arresting sight. There are no wing mirrors anymore – cameras relay what is happening around the vehicle on monitors. The ŠKODA VISION E forgoes B-pillars for an even greater amount of space. In comparison to the vehicle from the world premiere in Shanghai, the front has been further developed and now appears even more characterful. The generous amount of space, state-of-the-art assistance systems as well as numerous ‘Simply Clever’ features are typical for ŠKODA. The ŠKODA VISION E drives autonomously at level 3. This means that it can completely take over steering on motorways, for example. Here, the systems control overtaking and evasive manoeuvres, accelerate and apply the brakes. In dangerous situations, the driver is prompted to take over the steering wheel again within a defined time frame. From level 3, vehicles also communicate automatically with other vehicles. This allows them to inform one another of potential dangers. 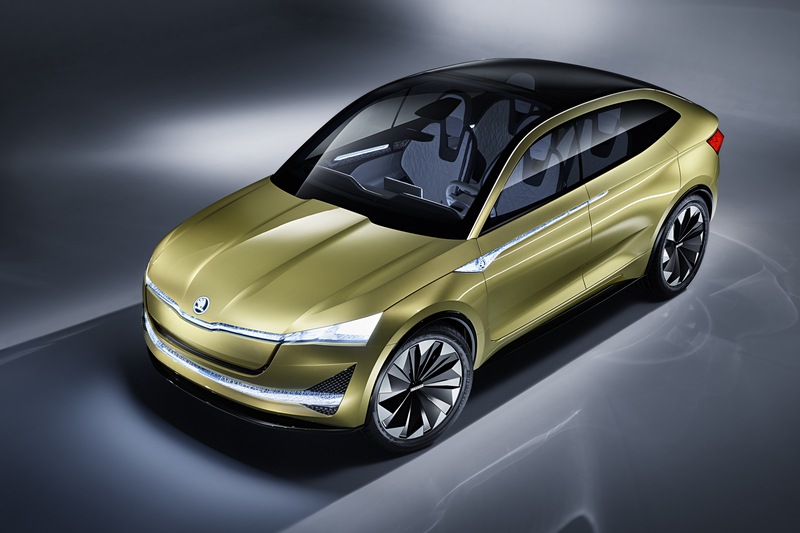 In addition, the ŠKODA VISION E can already communicate with infrastructure. With the ŠKODA VISION E concept car, the Czech car manufacturer not only provides an outlook on the fully electric and thereby zero-emission future of mobility but also on the forms of automated and autonomous driving which can be realised very soon. Additional opportunities to relieve the driver are being created based on the assistance systems that are already available in ŠKODA production models today. The technology presented in the ŠKODA VISION E allows further driving tasks to be delegated to the vehicle. Level 1 describes assisted driving. Amongst others, the systems at this level include cruise control, which controls the speed and also the distance to the vehicle in front. At this level, the driver must always have their hands on the steering wheel and pay attention to the traffic. Another example are emergency brake assistance features which take over the braking but leave all other vehicle control tasks to the driver. The systems are often limited in their functionality. Some systems are, for example, only partly operational in adverse weather conditions or only work up to a certain speed. Level 2 describes semi-autonomous driving. At this level, vehicles can autonomously drive straight on, stay in lane or control the distance to the vehicle ahead autonomously in predefined situations – for example on a motorway. In traffic jams, the vehicle can autonomously take over all of the driving, steering and braking. Here too, adverse weather conditions can lead to restrictions, when dirty sensors hamper the electronics, for example. Level 3 describes highly-autonomous driving. Level 3 vehicles can, for example, completely take over steering on motorways. Here, the systems control overtaking and evasive manoeuvres, accelerate and apply the brakes. In dangerous situations, the driver is prompted to take over the steering wheel again within a defined time frame. From level 3, vehicles also communicate automatically with other vehicles and exchange information. Level 4, fully autonomous driving, is expected to be achieved in a couple of years’ time. Most of the time, the vehicle will then move autonomously and master even complex situations on country roads as well as in urban traffic. The drivers can occupy themselves with other things during the journey and does not need to have an eye on the surrounding traffic all the time. The vehicle is then also completely connected with its environment. At level 4, urban traffic is also controlled automatically, for example by switching traffic lights to green when a vehicle approaches junctions and no traffic from side roads is detected. The vehicles communicate with each other and notify each other of a change of lanes for example. From level 5, vehicles are autonomous from the starting point to the final destination. The occupants do not have to perform any driving tasks. This means that these driverless cars need neither a steering wheel nor pedals. “The ŠKODA VISION E concept car achieves the requirements for level 3 of autonomous driving. It can operate independently in traffic jams, complete motorway journeys using autopilot, stay in lane or take evasive actions, overtake other vehicles, independently look for free parking spaces and drive in and out of parking spaces autonomously,” said Christian Strube, ŠKODA Board Member for Technical Development. All of this is aided by various sensors with different ranges and various cameras that monitor the traffic situation. Different levels of communication are also installed and tested. The ŠKODA VISION E is – like many ŠKODA production models today – connected to the driver’s smartphone or other mobile devices and communicates with them. However, car-to-car communication and car-to-infrastructure communication are also possible with the ŠKODA VISION E.
The ŠKODA VISION E is a fully electrically driven concept car based on Volkswagen Group’s modular electric car platform. Thanks to its power output of 225 kW (306 PS) generated by the two electric motors, the ŠKODA VISION E accelerates instantly and extremely dynamically. The ŠKODA VISION E’s top speed is limited to 180 km/h. The powerful lithium-ion batteries and intelligent brake energy recovery enable a range of up to 500 km. “Typical for electric motors, the characteristics include maximum torque available from a standing start, which results in very good responsive qualities. When accelerating, the concept car thereby achieves the highest level of dynamism ever experienced in a ŠKODA,” said Christian Strube, ŠKODA Board Member for Technical Development. The ŠKODA VISION E’s top speed is electronically limited to 180 km/h. Thanks to the efficient and powerful lithium-ion batteries and an intelligent brake energy recovery system, a range of up to 500 km is achieved. When charging, 80 per cent of the battery capacity is reached in just 30 minutes. Due to intelligent management, the two electric motors with 225 kW (306 PS) work together with maximum efficiency and permanently drive all four wheels of the ŠKODA VISION E. The intelligent all-wheel drive further enriches the purely electric driving experience. Front and rear wheels are driven as required based on the driver’s demands and the individual driving situation to ensures as well as maximum level of stability, safety and dynamism at all times. The powerful, liquid-cooled lithium-ion battery is housed in the crash protection area deep in the chassis floor and centrally between front and rear axles. This positioning of the slimline high voltage storage unit also contributes to the favourable weight distribution between the front and rear axle as well as to the ŠKODA VISION E’s low centre of gravity. The ŠKODA VISION E has numerous in-car safety systems which support the driver in any situation: when driving normally, during autonomous driving and when parking. Front Assist detects obstacles in front of the car and applies the brakes automatically when necessary. Blind Spot Detect and Rear Traffic Alert identify dangers outside of the driver’s field of view and emit a warning or even apply the brakes automatically. The system also accelerates or applies the brakes when required in traffic jams or when driving. Various parking assistance systems not only guide the car to available parking spaces but also reverse the car out of a parking space automatically. The ŠKODA VISION E is equipped with numerous assistance systems which increase safety and comfort. Already available for many of the current ŠKODA models today. They include Front Assist including City Emergency Brake function with Predictive Pedestrian Protection, which detects obstacles in front of the vehicle via radar and automatically applies the brakes if required. Blind Spot Detect warns the driver not to change lane when there is a vehicle in their blind spot. This also applies when driving out of parallel parking spaces. Another safety system provides assistance when reversing out of parking spaces: Rear Traffic Alert, the ‘eyes’ at the rear of the car. It uses radar sensors to detect approaching vehicles, warns the driver and automatically applies the brakes. Parking manoeuvres can also be performed automatically: Park Assist automatically guides the car in and out of parking spaces. In moving traffic, Adaptive Cruise Control keeps the car at a safe distance from the vehicle in front, Lane Assist prevents the car from deviating from its lane, and the Driver Alert fatigue detection system detects signs that the driver is losing concentration and prompts them to take a break. Travel Assist with Traffic Sign Recognition is also active in the ŠKODA VISION E. Other features on board include Traffic Jam Assist, which automatically accelerates or applies the brakes, as well as the autopilot for motorway driving, which steers, takes evasive action, brakes and accelerates independently (provided that the motorway fulfils the conditions for autonomous driving). Car Park Autopilot is particularly helpful in busy towns and cities. The system automatically searches for and guides the car to free parking spaces. The Intelligent Parking function can do even more: it memorises and finds the driver’s preferred parking locations. The ŠKODA VISION E features various laser and radar scanners around the vehicle: long-distance laser scanners and a 3D camera for monitoring the environment in autonomous driving operation, radar sensors for detecting vehicles and obstacles at mid-range distances as well as radar scanners for shorter distances. All of the sensors and scanners work together with the different assistance systems. The data is processed by an analysis and control unit with an extremely large amount of processing power. 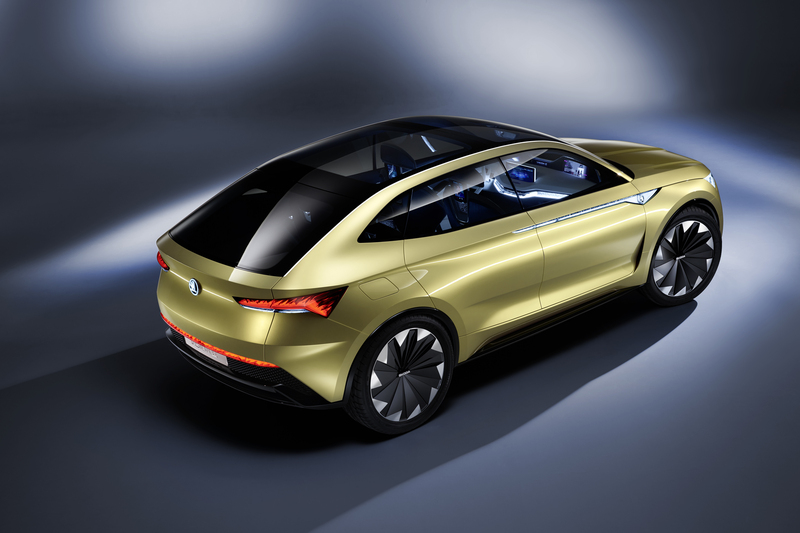 With a length of 4,688 mm, a width of 1,924 mm and a height of 1,591 mm, the ŠKODA VISION E exudes great presence. Due to the long wheelbase – 2,851 mm – and the short front and rear overhangs, the engineers were able to create a very generous and comfortable interior that is typical for ŠKODA. The future-oriented car combines an SUV-style raised seating position and a generous amount of space usually seen in a hatchback with a dynamic silhouette and a gently sloping roofline, in the coupé style. “Czech crystal glass art, which enjoys high international prestige and has a long tradition, is an important source of inspiration for the modern ŠKODA design. It combines classic manufacturing processes with modern aesthetics. The ŠKODA VISION E is therefore also a reference to cultural heritage in the brand’s homeland,” said Karl Neuhold, ŠKODA Head of Exterior Design. The ability to produce high-quality, emotive works of art from simple, precise shapes is consistent with the fundamental values of the Czech car brand, whose vehicles harmoniously combine aesthetics and functionality. ŠKODA’s brand-typical design language has continually developed in recent years. The concept studies have introduced the anticipated new details: in 2011 with the ŠKODA VISION D and subsequently with the ŠKODA VISION C (2014) and ŠKODA VISION S (2016). This continuous development is also reflected in the latest new models and has now been elevated to a new level with the ŠKODA VISION E.
The front section of the ŠKODA VISION E, having been developed further, is characterised by the striking design of the bonnet, which is sculptured and features edges running towards the centrally placed brand logo that shines in white. Below the bonnet, a wide LED lighting strip runs across the vehicle’s entire width and flows at both ends into slim, triangular headlights. All lighting units at the front and sides are in white. As with other electrically powered cars, there is no classic radiator grille. The lower section of the car’s front features a thin black bumper trim above the front spoiler. This connects the two triangular grilles of the outer air inlets. The combination of classic ŠKODA design details and new features lends the ŠKODA VISION E an extremely compact, robust and dynamic appearance. The side view is characterised by the sharp incline of the windscreen, and the roofline, which begins to gently slope towards the rear at an early stage. This design accentuates the coupé-style appearance. There is neither a classic B-pillar, nor are there the typical wing mirrors. The opposed-opening rear doors, which are operated electrically, make getting in and out of the car extremely comfortable. The tailgate is also electric. There are no wing mirrors but rather cameras that transfer what is happening around the vehicle onto interior displays and continuously keep the driver informed. This solution improves the vehicle’s aerodynamics and the functions previously associated with the wing mirrors (e.g. recognition of vehicles). For the ŠKODA VISION E, the designers have come up with a very special lighting concept. 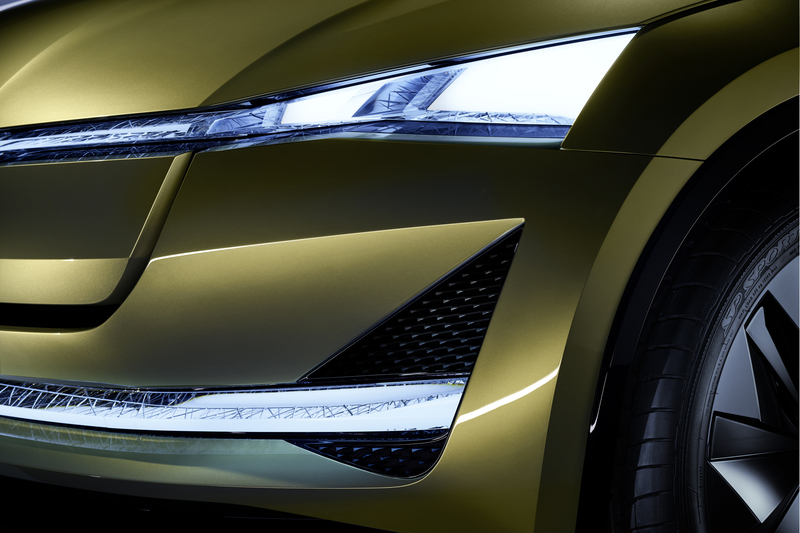 The ŠKODA VISION E’s headlights feature Matrix LED technology that ensures a particularly comprehensive road illumination which is always adapted to the individual driving situation. The highly efficient LED headlights produce a dipped and high beam which are not only directed very precisely onto the space in front of the car but also remarkably evenly. Due to innovative control technology, the adaptive light distribution reaches an additional level of quality. The single diodes are controlled together with the lenses and reflectors for targeted illumination of individual road areas whilst other areas are left out. Lighting control is connected to a front camera to analyse the individual traffic situation which includes recognising preceding and oncoming cars in good time. The data of this records allow for a precise definition of the light distribution at all times. This again enables optimum use of the headlights’ range when driving with high beam whilst eliminating a blinding effect for oncoming road users at the same time. With the ŠKODA VISION E, all of the tail light functions feature advanced LED technology. The LED light sources are particularly energy efficient and produce a high contrast effect. This leads to particularly harmonious and expressive signalling of all relevant lighting functions such as tail light, brake light and indicator. There is a further strongly contoured line below the lighting units which takes up and continues a corresponding line on the side. The strong moulding of the line and the tailgate spoiler create a concave surface area which incorporates the tail lights and the brand logo, which shines in white. A further LED lighting strip runs below the rear line and a black apron rounds off the rear section’s bottom part. As with all fully electrically powered vehicles, there is neither an exhaust system nor are there tailpipes. The distinct horizontal lines and the dynamic wedge shape give the ŠKODA VISION E a particularly sporty appearance, even when stationary. The combination of design elements and classic ŠKODA features make the ŠKODA VISION E an attractive representative of the Czech car manufacturer’s evolved design language. There is no transmission tunnel due to the concept, which creates a particularly spacious interior with four individual rotating seats that are slightly raised and come with new backrests. The opposed-opening doors are electrically operated. Thanks to the large glass surfaces, the interior is light and transparent. The concept of horizontal lines is continued consistently and underlines the interior’s clear-cut structure and generous amount of space. Besides the cockpit screen for the display of conventional vehicle data, there are further displays for the passengers on board the ŠKODA VISION E. The central touchscreen is located in the middle of the dashboard, so that the driver and front passenger can operate and read all of the important functions and services such as those provided by ŠKODA Connect. In addition, there are individual displays for the front and rear passengers to allow for the operation of numerous comfort functions such as information and entertainment. The front passenger display is integrated into the dashboard whilst the displays for the rear passengers are in the front seats’ backrests. Furthermore, the front and rear passengers can control their individual entertainment program using their own touch displays. The front passenger’s control unit is incorporated into the right armrest; the rear passengers’ control unit is located between the two rear seats. Ambient lighting is integrated into the doors’ decorative strips and below the dashboard. It can be set to one of ten colours and can therefore be adjusted to the individual mood. As soon as the vehicle drives autonomously, you can slide the front seats back and enjoy guaranteed maximum relaxation. At the same time, the steering wheel is raised, providing the largest possible amount of space and a corresponding degree of comfort. The ŠKODA VISION E is equipped with the latest infotainment systems. All the capacitive touchscreens come in a ŠKODA-typical glass design. Thanks to a superfast LTE module and the most cutting-edge navigation system with a built-in Wi-Fi hotspot, which connects all of the occupants’ mobile devices, occupants of the ŠKODA VISION E are ‘always online’. The range of infotainment features is complemented by the ŠKODA mobile online services, which provide real-time navigation with alternative route suggestions, information, entertainment and assistance. In the event of an emergency, an emergency call is made automatically and, in case of a breakdown, the driver can request assistance by pushing a button. Via the ŠKODA Connect portal, the customer can even configure services from their home computer as well as transfer destinations, routes and points of interest to the car. Online Traffic Information transfers traffic flow on the selected route to the car in real time and suggests alternative routes in the event of a traffic jam. The services also provide tailored information on parking spaces, news and the weather. Navigation in the ŠKODA VISION E uses photo-realistic map views; street views can be seen in the form of 360-degree panoramic images. Destinations are requested by text entry or voice control. If the driver is planning the route in advance from home, the ŠKODA Connect app informs about the best time to set off, in view of the current traffic flow. The Care Connect services support the VISION E’s occupants in many situations. The data is transferred via a SIM card that is installed in the vehicle. If the restraint systems have been activated following an accident, the Emergency Call function establishes a voice and data connection to a dedicated emergency call centre and transfers all of the relevant information. The Emergency Call function can also be operated manually. Using the Breakdown Call function, the driver can have technical questions answered or can request assistance in the event of a breakdown. With help of the Proactive Services feature, service appointments can be arranged with a dealership and vehicle-related data can be passed on to the garage. Numerous online services can be run via the ŠKODA Connect app on a smartphone and allow the status of the car, e.g. whether it is locked and whether the lights are on, to be checked and managed remotely. The current range of the ŠKODA VISION E can also be accessed when away from the vehicle. A new connectivity feature is individual car preconditioning. Playlists, auxiliary heating and navigation destinations, for instance, can be programmed prior to the journey also the electric range can be checked. A digital key on a smartphone, smartwatch or tablet can be used to open the car. In addition, the route planner can suggest routes based on the driver’s preferences. Information about the weather and traffic are also customised. 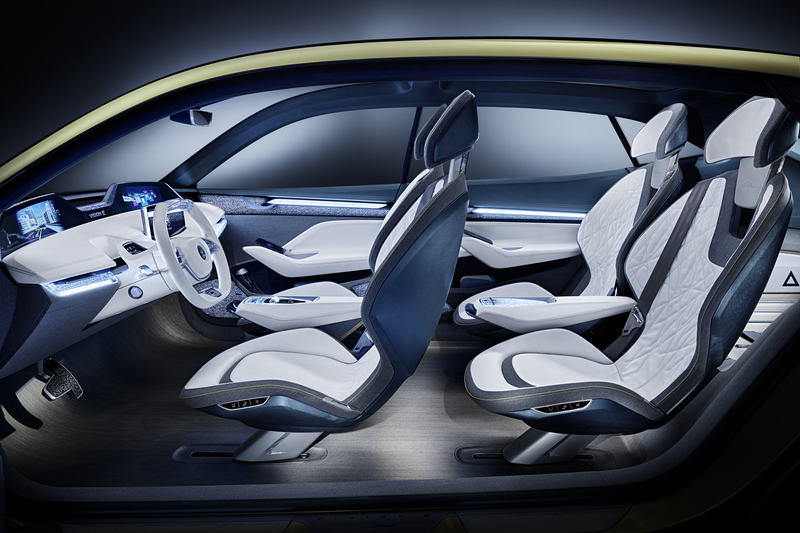 The ŠKODA VISION E’s display and operating concept also comprises new systems that optimise comfort and safety while driving. The innovative digital Human Machine Interface (HMI) system guarantees maximal flexibility when controlling numerous functions in the car. The infotainment, communication and navigation functions can be activated and controlled both with the help of a central control unit on the centre console or via the individual touchscreens. Furthermore, the concept car is equipped with a particularly advanced version of voice control. When selecting navigation destinations or infotainment programs, the driver can for example give instructions not only using predefined terms, but also by formulating them into full sentences. The system understands the context of these sentences and implements them. Other new features available in the concept car include the Eye Tracking function, which constantly monitors the driver’s eye movements. Using this, the camera-based system is able to always display the information required by the driver at the right time and in a perfectly ergonomic position on one of the screens in the interior. For example, if the driver turns to the central in-car monitor to select their desired entertainment program, driving-related information and possible warning messages are also briefly displayed there. This enables the driver to see all the important information in front of them – even when they intermittently take their eyes off the road. The Eye Tracking function can also be used to analyse how alert the driver is. When the driver’s concentration is waning, the Driver Fatigue Monitor is activated and prompts the driver to take a break. 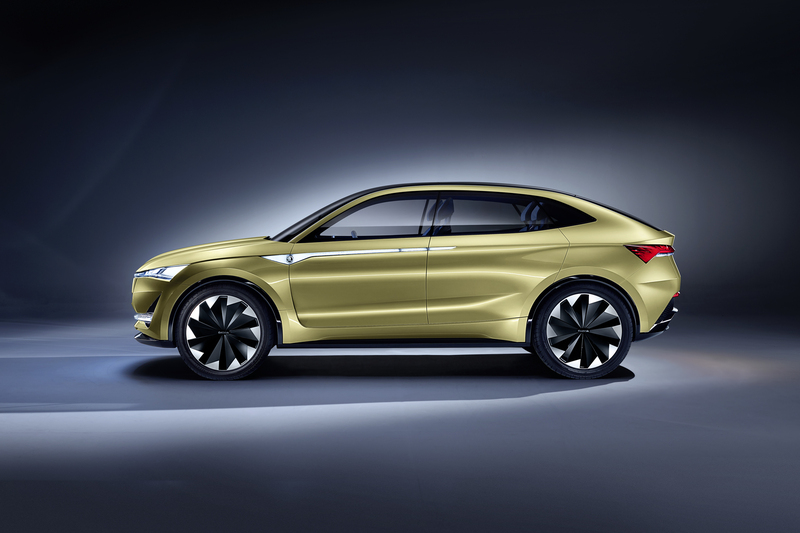 Another system that optimises safety and that is being introduced in the ŠKODA VISION E is the heart rate monitor, which constantly monitors the driver’s heart rate and warns them if it is at a dangerous level. Comprehensive connectivity between the car, driver and passengers provides an extremely comfortable and safe journey. All of the connectivity features available offer improved access to information, a wide range of entertainment and an even higher level of safety. Via the car network, all ŠKODA VISION E passengers can send data such as route suggestions or playlists to the driver and communicate with each other as they like.